Preheat oven to 400ºF. In a large bowl, mix together cinnamon and sugar. Place melted butter in a second large bowl. Open pie crusts and cut each into 1 1/2-inch wide strips. Dip each strip in melted butter, then into cinnamon sugar mixture. Place on a parchment-lined baking sheet, twisting each strip a bit and securing to sheet at each end. Bake for 11-14 minutes or just until pie strips are golden brown around the edges. Remove and cool. In a stand mixer or large bowl, beat together cream cheese, icing sugar, and vanilla. Spoon into a 9-inch pie pan. Top with cherry pie filling. Refrigerate until ready to serve. 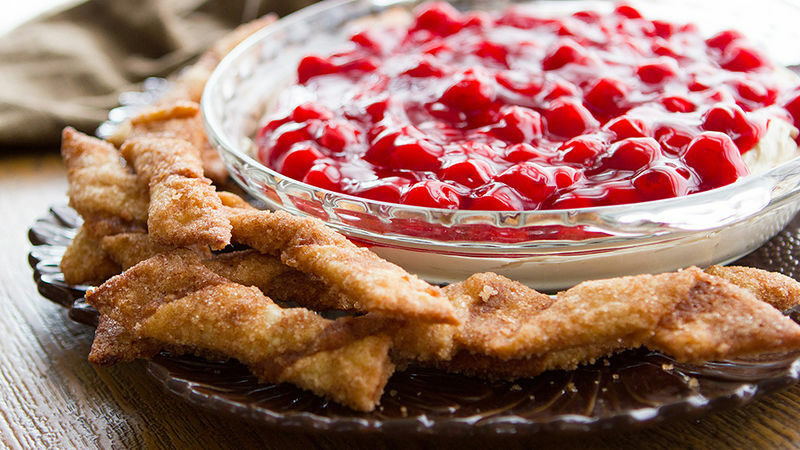 Serve dip with pie-crust sticks for dipping.